The Black Elderberry useful properties. The use of elderberry is enclosed in its composition. This berry contains a significant amount of vitamins A, B and C, as well as iron, calcium, zinc, selenium, copper and other substances necessary for the body. Useful properties of elderberry appreciate not only folk, but also official medicine. Elderberry flowers have an effective diaphoretic effect. Infusions of these colors are recommended for various colds such as flu, sore throat. 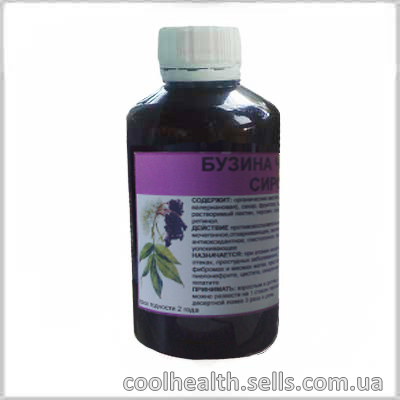 Elderberry relieves cough and helps to restore the body as soon as possible. In addition, elderberry extract has a mild laxative effect, so it is prescribed in the presence of problems with the gastrointestinal tract. The use of elderberry has been proven in relieving the symptoms of rheumatism, radiculitis. It eliminates many skin diseases, helps with gout and kidney disease. Elderberry is able to fight the deposits of toxins in the body. It is noteworthy that in the treatment of many and many diseases use all parts of this plant. Medicinal properties of flowers, berries, bark and roots of elderberry. In cosmetology elderberry also found a use. Preparations, which include this berry return freshness and elasticity to the skin, have a beneficial effect on the complexion and structure of the skin, eliminate acne and pigmentation. Culinary use of elderberry is no less diverse than its use for medicinal purposes. Elderberry is used to make jam, jam, jam, wine, compote, jelly, syrup. Of course, many refuse elderberry in exceptional taste, but it is proven and widely known that elderberry is able to improve the taste of our usual dishes. The caloric content of elderberry is 73 kcal. 100 gr. Very often, elderberry flowers and berries are added to tea, which gives it not only an unusual taste and unique aroma, but also significantly increases the beneficial properties of this drink. The Syrup of Black Elderberry composition. The Syrup of Black Elderberry properties. The Syrup of Black Elderberry application. Dosage: adults and children over 12 years - 1 tablespoon 3 times a day (you can dilute 1 Cup of warm water with honey). For children 6 to 12 years - 1 dessert spoon 3 times a day.